Leah + Josh are fellow Aggies based in College Station, who chose Canyonwood Ridge in Dripping Springs, Texas as their wedding venue. I remember meeting with Leah at a local cafe and talking about her vision for her wedding - her eyes were intensely beautiful and she was so easy to talk with. She booked our team for Month of Management (Coordination) plus design and styling. 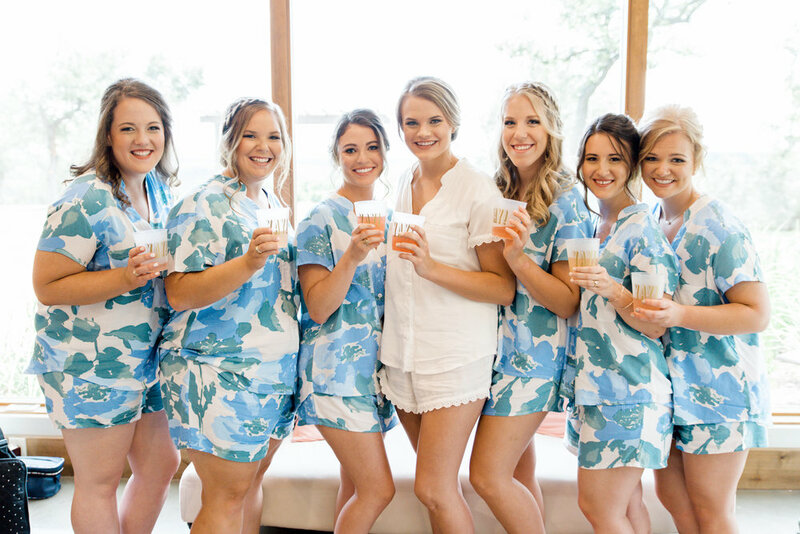 Being a wedding photographer herself, she was aware of all the details needed for a wedding, and knew she could handle the legwork leading up to the big day. Once we got closer, our team was able to get all her vendor ducks in a row, ensure all the details were covered and show up the day of to get everything looking spiffy and going smoothly. Leah had such immense trust and respect for our company, and we are incredibly grateful for her allowing us to be part of her big day marrying Josh! While we constructed her vision, Leah and Josh spent the morning relaxing and getting ready with some of their favorite people. Instead of a first look with the soon-to-be hubby, Leah opted to do a first look with her dad (seriously some of our favorite moments!!! ), and then a first touch and prayer with Josh. Her dress was stunning on her with it’s minimal design and low V back finished with a bow! Her jewelry was a mix of modern touches and classic heirloom pieces passed down from family. The men wore dashing tux’s with bow-ties and playful socks. Her reception was the perfect mix of timeless romance with a touch of whimsy. The decor was romantic, organic and minimal - using napkins and runners to add in the pop of dusty blue. Floral was simplistic and elegant in timeless milk glass bud vases, paired with hand laid greenery runners and wildly beautiful smilax adorning various accent areas. Pops of blush pink were added in the floral with various roses and blushing bride protea. Once the reception kicked off, guests were allowed to roam the vast property or get down on the dance floor. We perfectly positioned the DJ right off the dance floor for easy interaction. An inviting lounge was nestled under a grove of trees outside, which allowed guests to sit, relax and watch the party through the wall of glass windows - or watch kids in the nearby grassy area where fun activities and bubble wands kept the young kids busy. We also incorporated a few seated cafe tables and cocktail tables outdoors for those wanting to mix and mingle with family and friends they haven’t seen in a while.